Hematocrit (Hct) (%) 15 - 65 2% C.V.
Hemoglobin (Hgb) (g/dL) 5.0 - 20.0 1.9% C.V.
WBC Count (x 10⁹/L) 1.6 - 99.9 6.4% C.V.
Granulocyte (x 10⁹/L) 0.8 - 70 < 3.2 S.D. Lymphocyte/Monocyte Count (x 10⁹/L) 0.8 - 99.9 < 3.2 S.D. Platelet Count (x 10⁹/L) 20 - 999 6.0% C.V. Ships with thermal printing paper, 104-key keyboard, 8GB USB memory stick, and 20 pack of STAR tubes (P/N 429011). The QBC STAR™ Dry Hematology System is the gold standard for performing CBC testing in a variety of settings, including office labs and even remote locations. The QBC STAR™ employs innovative dry hematology technology, meaning that all of the reagents needed to perform a CBC test with the QBC STAR™ System are contained in the QBC STAR™ Tube. 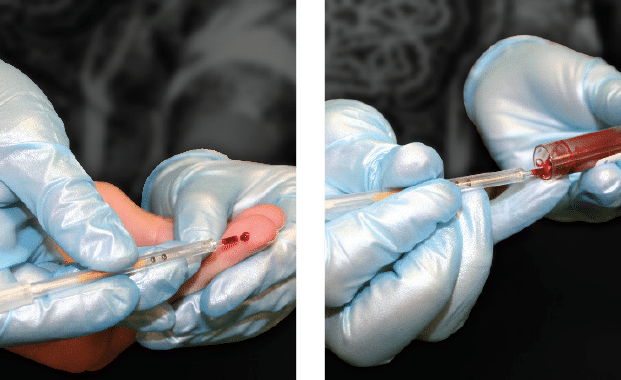 After filling the tube with the blood samples, the clinician simply places it in the specially designed QBC STAR™ System and obtains the test results after the analysis is complete. This unique approach provides multiple benefits for in-office CBC testing. Because the reagents needed for the STAR™ are contained within a single tube, there is no need for the liquid reagents associated with conventional CBC analyzers. This means no boxes of bulky reagents that take up needed lab space, or complicated logistic and supply chain issues to deal with. The dry system that the STAR™ uses also means that there is no need to dispose of dangerous biohazard reagent chemicals, making the STAR™ easier to use and more environmentally friendly than other analyzers on the market. The QBC STAR™ Dry Hematology System is extremely compact, weighing only 19 lbs (8.6 kg) and measuring a small 16″ x 16″ for the entire self-contained unit. Because its reagent technology is contained within a single tube, the STAR™ is remarkably portable and effective in many different testing environments. Installation time is less than 30 seconds, meaning the STAR™ is ready for use wherever and whenever needed. Unlike other hematology systems, the QBC STAR™ is fully automated and so easy to use that non-technical personnel can operate it with minimal training. The operator simply inserts a STAR™ Tube into the machine, presses the START button, and walks away while the system performs a fully automated CBC analysis. The QBC STAR™ measures nine important CBC hematological parameters from venous or capillary blood samples: hematocrit, hemoglobin, MCHC (mean corpuscular hemoglobin concentration), platelet count, white blood cell count, granulocyte count and percentage, and lymphocyte/monocyte count and percentage. Clinical trials have demonstrated that the accuracy and precision of the QBC STAR™ System correlates well to accepted standard methods. 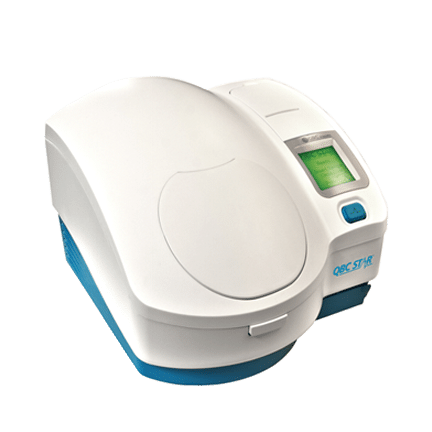 The QBC STAR™ Dry Hematology Analyzer is a compact and easy to use hematology analyzer that brings the CBC parameters to the patient’s physician at the point of care and can economically comply with the CDC recommendation to use dedicated medical equipment. Is the QBC STAR™ considered CLIA waived? Is the QBC STAR™ FDA approved? Yes. Information on the QBC STAR™ 510K can be found on the FDA website here. How often do I have to run External Controls on the QBC STAR™? What is EQC (Equiavalent Quality Control) Option 1? Advances in laboratory technology have led to test systems that include internal monitoring systems or controls that check all or a portion of the test system’s analytical components each time a test is performed. The CLIA regulations now allow the laboratory to reduce the frequency of testing external quality control materials for certain test systems. The QBC STAR™ qualifies for EQC Option 1. More detailed information about the CLIA requirement pertaining to equivalent QC procedures can be found here. The controls may work in the short term, but may be prone to early degradation. If the controls are warm, a replacement set can be requested by calling QBC Technical Support at +1-866-265-1486 (US only). Is there a QC program for the Daily Control Tracking? What parameters does the QBC STAR™ report? What type of sample is required for QBC STAR™ testing? Whole blood samples collected from a capillary fingerstick, capillary heel stick, or a venous blood draw (EDTA purple top tube). How much blood is required to test on the QBC STAR™? The STAR™ Tube requires 70µl of blood. How long can a venous sample be stored prior to testing on the QBC systems? Refrigerated samples stored at 36° to 46°F are stable for up to 8 hours. Note: Bring the sample back to room temperature before you prepare the STAR™ tube. 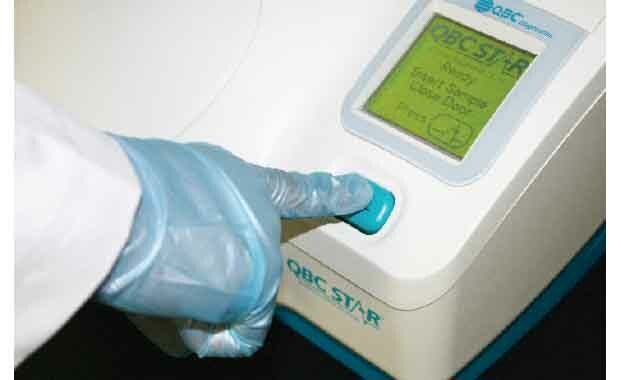 Can a sample be processed more than once on the QBC STAR™? Yes. Once centrifuges, the QBC STAR™ Tubes can be analyzed more than one time. The tube must be stored in an upright position and is stable at room temperature for up to four hours. Simply insert the tube and begin the STAR™ as usual. During its initial slow spin, the STAR™ will recognize that the tube has already been centrifuged and move directly to the scanning phase. Is the QBC STAR™ compatible with electronic record keeping systems? Yes. The QBC STAR™ is compatible with such systems. It is recommended that you contact a third party integrator for assistance with connecting the STAR™ to your system (see next question). How can I get results from my QBC STAR™ into Other External Systems (e.g. EMR, LIS, etc.)? What external printers are compatible with the QBC STAR™? The HP Officejet 6100 has been tested and found to be compatible with the 2012 STAR™. Please contact Drucker Diagnostics for the latest list of compatible printers. What kind of paper can be used with the internal printer of the QBC STAR™? The QBC STAR™ uses 2.25-inch thermal paper tape. Replacement rolls are available from Drucker Diagnostics. Verify that the paper is turned to the thermal side; only one side of the paper is capable of showing the printout. The paper should run under the roll before feeding through the roller. Can I reprint the results on the QBC STAR™? Yes, as long as the tube is still in the instrument. Press the START button. The results from two difference CBC methodologies will rarely be exactly the same. Confirm that the results are from the same sample. If one set of results is from a capillary sample and the other set is from a venous sample, the results could vary significantly. 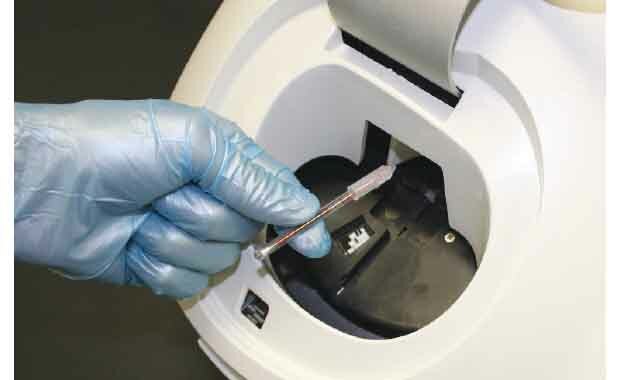 If the results vary between multiple capillary or multiple venous samples, it could be due to differences in the times of collections technique. If the results are from the same venous sample, remix the venous tube at least 12-15 inversions prior to sampling. Confirm that the test was performed within the acceptable time limit and that the venous sample was stored according to the manufacturer’s recommendation. What CPT code is used for reimbursement of tests run on the QBC STAR™? The CPT Code for the QBC STAR™ is 85025, CBC with differential. What is the cost per test to run the QBC STAR™? Because of the unique dry hematology method that the STAR™ uses, the cost per test is much easier to identify than wet hematology systems that have hidden operational and service costs. The only disposables used by the STAR™ are the QBC STAR™ tubes and CLIA required hematology controls. For an estimate of the cost to operate the QBC STAR™, please view the Economics Section. Is there a local representative who can give a demonstration of the QBC STAR™? Drucker Diagnostics works primarily through distribution channels and has partners throughout the US and around the world. These partners supply and support the QBC STAR™. To find a distributor near you, please visit the Where to Buy page. The technology at the heart of the STAR™ is a process known as Quantitative Buffy Coat (QBC) analysis. This process, which gives QBC Diagnostics its name, is based on the physiological phenomenon in which the differing densities of blood components will cause them to separate into layers when centrifuged at a high rate of speed. QBC tubes, including the QBC STAR™ tube, take advantage of this phenomenon in two ways. First, through the use of a small plastic float with the approximate density of platelets and white blood cells, (the “buffy coat”), those usually small layers can be physically expanded for greater analysis. Second, stains coating the inside of the tubes stain lymphocytes and monocytes green, platelets yellow, and granulocytes orange, making the difference between layers visible, even to the naked eye. The STAR™ combines this technology with its own advances to provide one-of-a-kind ease for the user. The STAR™ contains an internal centrifuge, which begins rotating the tube as soon as the START button is pushed. Once rotation is complete, the illumination/read station of the STAR™ utilizes an LED light source and optical detector to read the results of the test. Once complete, the STAR™ displays the results on the LCD screen and automatically prints them on its internal thermal printer. In addition to the technology used to provide test results, the STAR™ also includes many subsystems to improve the user experience. The QBC STAR™ runs build-in analytical quality control checks every time a sample is processed to ensure accurate and effective results. Sample integrity checks include: statistical matching of band lengths, ratios and absolute values for signal levels, ratios that are used to evaluate the quality of interfaces, measurement of float length, verification of optics and sensors, and measurement and evaluation of sample fill volume. Additional tests are performed as part of each assay cycle include centrifuge speed and electro-optical verification. Results are reported on tube tests only if all analytical quality control checks pass. The STAR™ also contains data ports that can be used with additional printers, a keyboard, or a bar scanner to customize it for a user’s individual needs.